Best $6.35 I ever spent and a driving technique to help “blind spot drivers” to see you – please see “The Magic continues” at bottom of post. If you drive in heavy traffic, this could change your riding experience forever. I just experimented with putting a plastic gas tank on my Virago 250 to reduce the weight of my bike. The frame below the tank is 3 5/8 inches wide but since it is off-center (about .75 inch to the left side), the tank would need to have a 4.5 inch tunnel width. I decided to get a tank from a motocross bike or ATV as they are a little cheaper than other tanks – but I knew that it would not look too good. I got a Yamaha Warrior (ATV) gas tank for $17.95 shipped. I might be the first person to ever put a Yamaha Warrior gas tank on a Virago 250 (probably the only person). The tank is scratched and does not have the decorative cover, so, as expected, it looks pretty bad. The tank can be put on facing frontwards or backwards – that is a clue that this is probably the wrong tank for this bike. It looks OK from 100 feet, unless you have good vision. The tunnel width was fine near the front, but there is not enough tunnel height, so it is like you raised the stock tank about four inches – there is a lot of open space now. I am not fussy about looks – my main problem with the tank was that it was too wide in back. I reduced the tank width at the back from 13 to 11 inches and the width is not a problem now. As far as the looks, these plastic tanks usually have a cover anyway – I have to think about getting a cover or just putting some sort of tank badge on it. 1) It really opens up the space below the tank, which gives the bike a different look. You can see more of the parts, which gives the bike an old, vintage look. 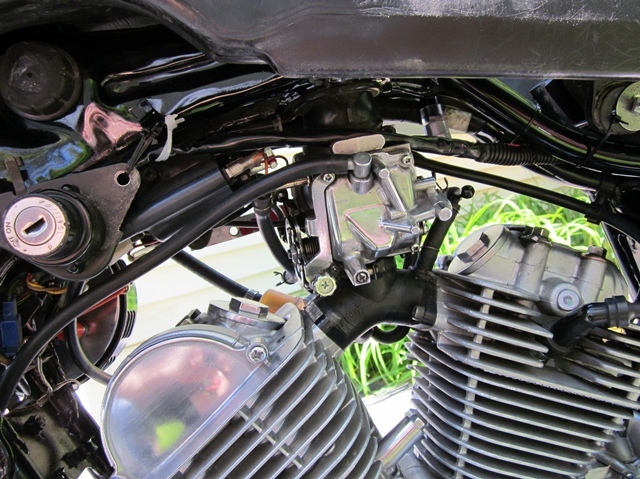 2) It is easier to adjust the valves and carburetor. 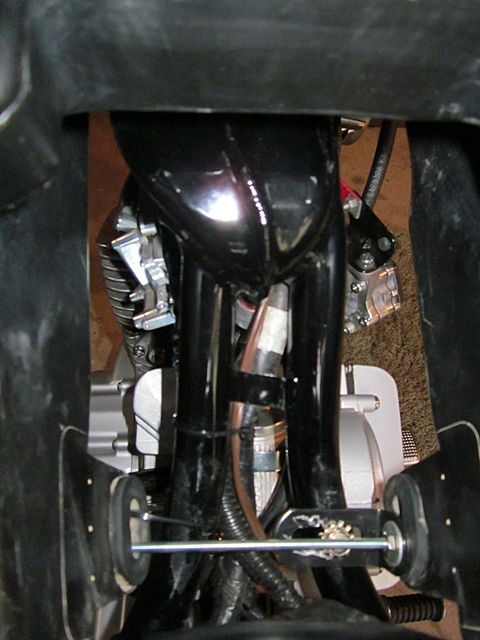 3) The carb is visible now so you can easily polish both sides close to a chrome finish. 4) Weight reduction of 3.6 pounds or 1.6 kilograms (4.3 lbs if you leave the fuel pump off – I tried it, but my bike did not run well). 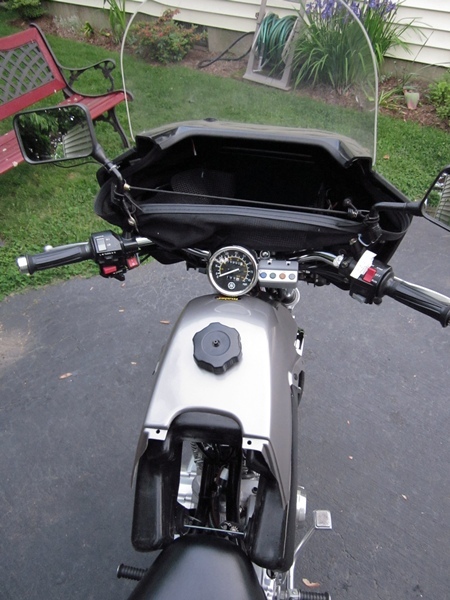 The tank cover weighs 13 ounces, so after adding that, the weight reduction is 2.8 pounds or 1.3 kilograms. If I put the time in to refinish the tank, I could get away with not using a gas tank cover. It covers only the top half of the tank, so for the Virago 250, it really is a gas tank half-cover. 5) The rear of the tank is open from the top, so you can store about 190 cubic inches of gear. 6) As you drive, you can see the engine and carburetor through the opening in the rear of the tank, which is pretty cool (you can add LEDs, too), plus if you have an engine problem, you will be the first to know. As you drive, you also get a decent breeze coming up from the opening. Also, you can hear the engine through the opening. At first, I disliked the opening in the rear of the tank, but now it has turned out to pretty cool. The Warrior ATV gas tank weighs about 4.1 pounds without the petcock and holds 2.4 gallons. update 5/30/12 – The End – My experiment using the plastic ATV tank is over – I put the stock tank back on last night. I am going to miss having it, but the looks bothered me even though I usually don’t care about that (in other words: it was really ugly). On the Virago 250, the petcock hides the left side of the carb and the fuel pump hides the right side of the carb, both of these polish up almost to chrome, so if I wanted to expose them more, I could probably change petcocks and relocate the fuel pump a little. If you ever change gas tanks, make sure that you mount it properly leveled. This is just an example, but for example if the rear is too low, the 2.4 gallon tank would only have 1.6 gallons that are usable – so you might run out of gas at 136 miles instead of at 203 miles. Also you could run out of gas when you are out in the middle of nowhere. You might take this as a sign that plastic is not for you, and you might re-install your stock tank as soon as get home. Please do not ask me why I am mentioning this. weighs about 8 pounds including the petcock, and the dimensions (approx.) are: 18 inches long, tunnel width near the top of the tunnel is 4 inches, near the bottom is 5 inches, height is 9 inches, width is 12.5 inches front, 10 inches mid-way, and 5 inches near the back. Capacity is 2.5 gallons, which is about 1.75 gallons Main and about .75 gallon Reserve (the exact amount is somewhere between .73 and .87 gallon). If you get 82 mpg, Main will take you to about 137 miles, then Reserve will take you about 62 miles. If you get 92 mpg, Main will take you to about 154 miles, then Reserve will take you about 69 miles. Whoa – that last paragraph was confusing – the longest I ever went on Reserve was 47 miles – I did not know it then but I would have run out of gas at 56 miles. Thanks to Lee E. for the question. You can just remove your tank if you want to clean and polish the carburetor like I did. If you want to re-mount the stock gas tank higher, keep in mind that a full tank weighs 24.2 pounds – gas tanks have to be mounted very securely. I continue to be amazed by this orange reflective vest that I bought recently. For the most part, people have stopped pulling out in front of me and also stopped tail-gating. I have seen many drivers start to change lanes, and then they see me and do not make the lane change. You should consider wearing a light colored vest (yellow, orange, or green) when you ride a motorcycle. “The Magic Vest Challenge” – Coming home this afternoon, I95 was backed-up for miles ( this is normal). Drivers would start to cut in front of me, then they would change their mind. I kept thinking “this car will do it”, “this one will do it”, and nobody did – nobody pulled in front of me. If you buy a reflective vest (mine cost $6.39 shipped) and use it for a week – I think that, like me, you will not care how goofy it looks. I have ridden 2,900 miles since I got this $6.39 vest. I drive in heavy traffic (I95 in Connecticut) a lot, and other drivers have basically stopped pulling out in front of me and also have stopped tail-gating. The only exception is the “blind spot drivers” – they still pull out in front of me or beside me in my lane – and the orange vest does not help because I am in their blind spot. I am thinking now on how to reduce the danger of these “blind spot drivers”. 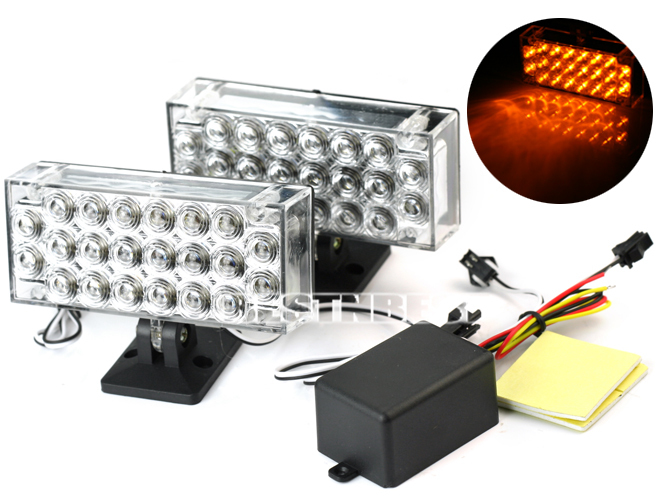 8/30/12 Today I installed two amber 22 LED emergency lights with flasher. I connected the headlight to a toggle switch so I could use the high/low beam switch for the emergency flashers (mounted in front). I will turn the flashers on (only for a few seconds) when I see an offending driver. I mounted the 22 LED lights to get the most brightness at about a 45 degree angle out from the front of the bike – many of the offending cars come from this direction. Do not use this technique near intersections or any cross-traffic – they might be able to see only one side flashing and they could think you are turning and pull out in front of you. 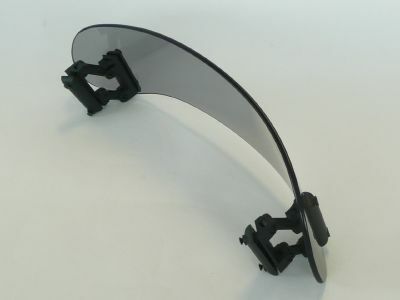 Use this only for “blind spot drivers” who seem to not see you – do not use it for aggressive drivers who see you but want to pull in front of you. The only purpose of this technique is to send a little extra light to the offending drivers in the hopes it will help them to see you even though you are in their blind spot. You have to be very selective on when to use this technique. I think it is more effective than idea #2 plus it is much easier to do. Idea #2 requires more focus to make sure you chose the left or right signal plus shutting it off quickly. Idea #1 (front emergency flashers) you can use more often, since the brightest light is going out only from the front at about a 45 degree angle and so it can’t be seen by all the drivers – only the ones that need to see it. 7/17/12 – I have been trying turning the turn signal on and then quickly off on the same side as the offending driver – and so far it seems to help a lot. If you try this, practice so you can have the turn signal blink only 2 times – this way other drivers will think you changed your mind about changing lanes. I added more turn signals for more brightness – position your front turn signals so you get more brightness at about a 45 degree angle out from the front of the bike – many of the offending cars come from this direction. Do not use this technique near intersections or any cross-traffic – they could think you are turning and pull out in front of you. Use this only for “blind spot drivers” who seem to not see you – do not use it for aggressive drivers who see you but want to pull in front of you. The only purpose of this technique is to send a little extra light to the offending drivers in the hopes it will help them to see you even though you are in their blind spot. You have to be very selective on when to use this technique – so far, for me I think it helps. Today’s random thought – Never drive more than 15 to 20 mph faster than the lane beside you – speed differential is very dangerous if you are on a motorcycle. virago250street.com – where seldom is heard, a discouraging word. This entry was posted in Motorcycles and tagged Virago 250 gas tank, Virago 250 gas tank mods, Virago 250 modifications, Virago 250 mods, Virago 250 plastic gas tank. Bookmark the permalink. 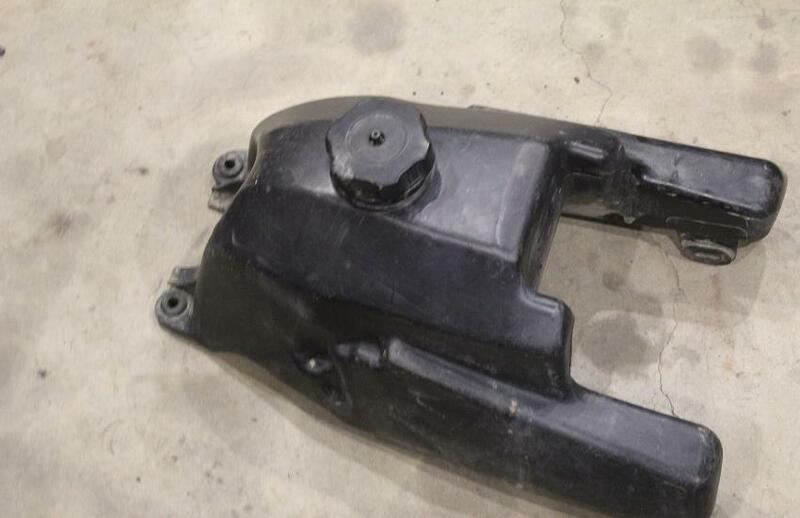 8 Responses to A plastic ATV gas tank on a Virago 250 – how bad would it look? hey bud, how are you? Great articles with the modifications. with all my mods, my fuel lines got crossed and I forgot how the fuel lines went. I was wondering if you may send me the schematic of how the fuel lines, Please. I’m having a hard time getting the bike started. Thanks for the kind comments. 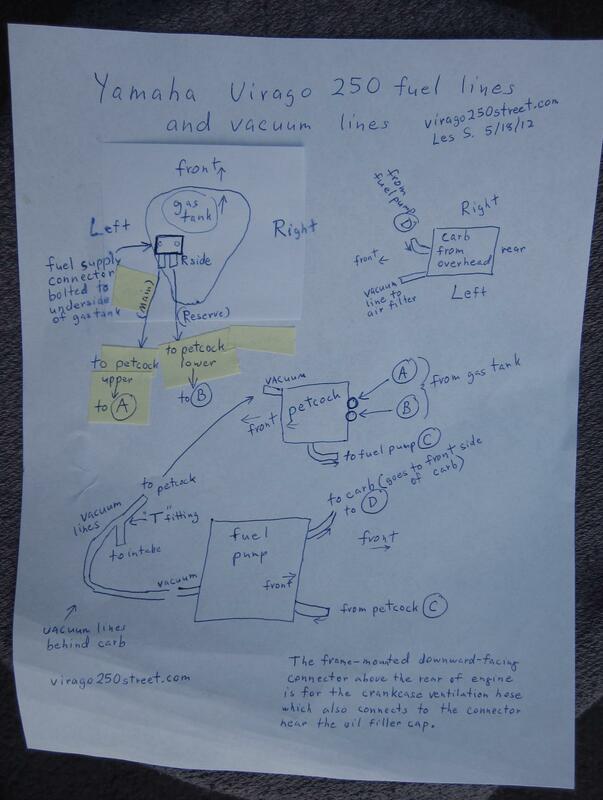 I did not have a drawing of the fuel lines, so I made a low-tech drawing which I added to the posting. Thanks for asking – this question always comes up and I had forgotten how part of it went – had to go look at my bike…..
Hey man nice job with the ATV Tank. 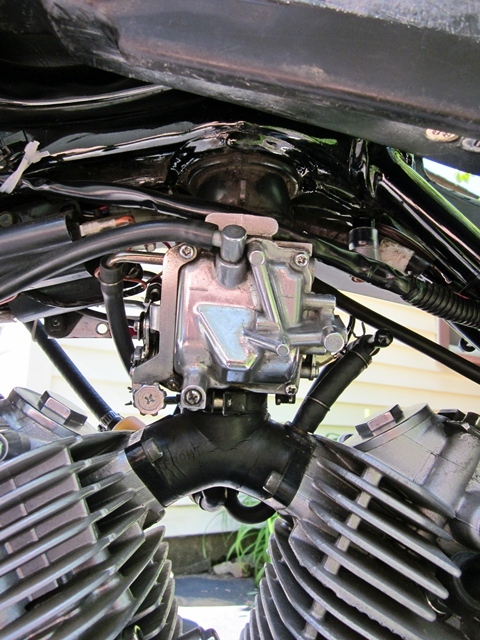 Have you ever considered a twin carb set up from a Yamaha SRV250? Or even an SRV 250 engine as they have a different camshaft profile to the XV250. Thanks for the comment. The way I drive, I like the mid-range torque of the Virago 250. I love SRV250’s, but the Virago 250’s torque curve is better suited for me. I think the single carb along with the fuel pump on the Virago 250 work great. For one thing, with two carbs you have to deal with carb sync. The simplicity of the Virago 250 is one of the things that make it such a great motorcycle. 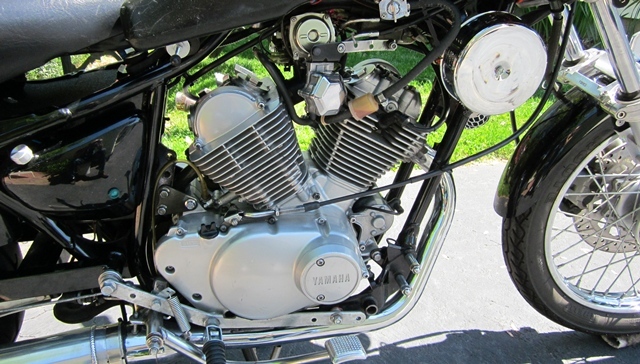 For example, the Yamaha Virago 250 has SOHC, four valves, one carburetor, air cooling, and weighs 328 pounds wet. The Kymco Venox 250 v-twin has dual overhead cams, eight valves, two carburetors, water cooling, and weighs 445 pounds wet. Greetings. I came across your website by chance. I was looking for a way to increase the virago 250 range by changing the fuel tank for a bigger one. I guess you are the first one to do it since I can’t find any one else who has done it. Congratulations! Its a very nice ride you have. I am thinking of buying one myself. Happy riding my friend. Hi José, Thanks for your comments. If you do buy a different gas tank, keep in mind that most other gas tanks will not fit. The Virago 250 frame has a hump that makes it very hard to fit another gas tank. The Warrior ATV plastic gas tank that I put on the bike fit terrible. I liked it for a while because it gave the bike an old-timey, Mad Max look. What ATV is the gas tank from? Hi Seccheus, Sorry, I left that out of the post – I will update it now with that information.